*Note: Cauliflower is an excellent source of vitamin C, vitamin K, folate, pantothenic acid, and vitamin B6. It is a very good source of choline, dietary fiber, omega-3 fatty acids, manganese, phosphorus, and biotin. Additionally, it is a good source of vitamin B2, protein, vitamin B1, niacin, and magnesium. – Add in the garlic and some paper seasoning bring to a small boil an let it cook for 2-3 minutes.. this will in fuse the flavors of the garlic. -Cover and cook for 8-10 minutes or until the cauliflower is soft. – Meanwhile is a separate pot, cook the Mushrooms with a splash of water and put aside. – You can also start making your pasta or spaghetti… Mine only takes 5-7 minutes so I like to make it right away. Pour your pasta into a pot of boiling water and cook until soft… do not overcook this type of pasta ( if you are using the rice & corn) because it will be sticky and hard. 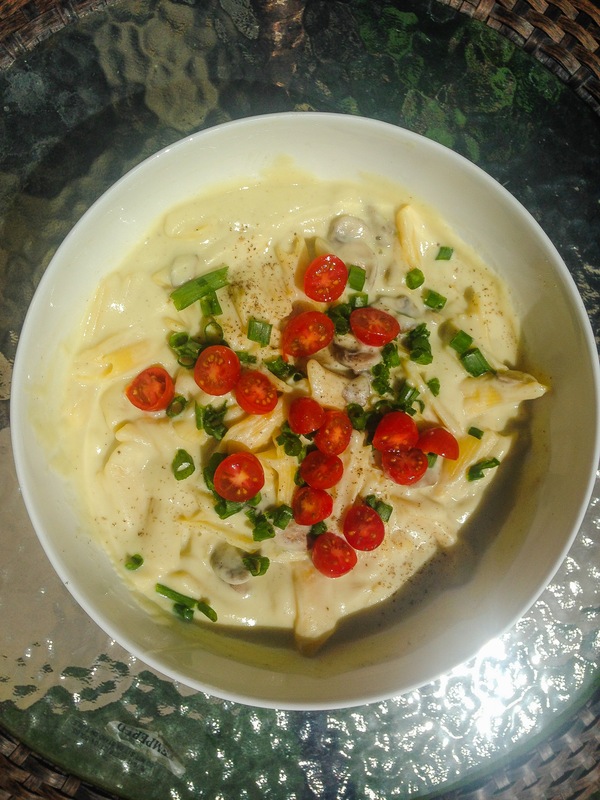 Serve your pasta on to a dish or bowl and pour in the creamy sauce, add in the mushrooms and mix it all up! add some cherrie tomatoes and Green onion on top and ENJOY! Previous The All Natural Face: Cruelty-free, Vegan & Non-toxic! Looks yummy! Now I want to try it!! Thanks for sharing this. it was pretty awesome 🙂 and the nutritional yeast just brings it all together 🙂 enjoy!